Rachel Aaron is an author you NEED to check out! 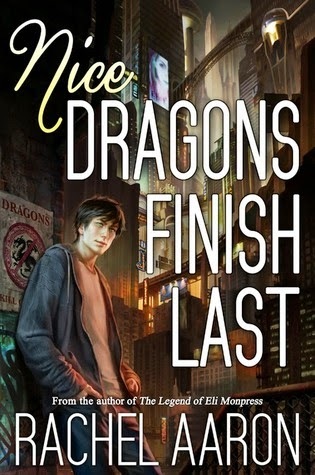 Nice Dragons Finish Last is the first book in Rachel Aaron’s Heartstriker series. Rachel Aaron is one of my favorite authors and I have loved every book she has written so far. Seriously. I could write long essays on my love for her Eli Monpress series. So when I heard that she was going to self-pub this book, I nearly died from excitement waiting for it. And dang! It was well worth the wait! An Awesome Cast of Characters! The main character, Julius, is wonderful! He’s strong, smart, and kind-hearted. And he's nice. The only problem with this is that he's a dragon and who has heard of a nice dragon? Because of his lack of dragon-like behavior, his mother ships him off so he can learn how to be a “real” dragon. Although right before she does this, she seals him. He is locked in his human form and not able to shift into his dragon form at all. Julius is one of the reasons I loved this book so much. Rachel Aaron did an excellent job creating a balanced and believable character. And as much as I loved Julius, I loved Marci Novalli even more! Marci is a Thaumaturgic mage who is running away from her past in Las Vegas and she is not one to mess with. She’s tough as nails and extraordinarily intelligent. Marci is the perfect compliment to Julius’ character. She’s perfectly willing to kill if she has to, while Julius is much more squeamish about that even though he’s the dragon. Man! Do I enjoy their interactions! The secondary characters are just as interesting as Julius and Marci! Just when you think that you understand their motivations and personality, something happens that sheds an unexpected light on them and reveals some new facet of their character. I seriously loved SO many characters! Especially Bob. He is a seer who sees everything and promptly forgets it. He is a hoot and he can't help that he steals the spotlight whenever he appears on scene. Not to mention, he is delightfully eccentric. Bob enjoys cryptic jokes, sending random “helpful” messages, and even has a pet pigeon. Bob is definitely my favorite! Also, I loved Ghost the Dead Cat that hangs around Marci. He is quite terrible in an interesting way. Dragons In A Post-Apocalyptic Magical Detroit! Magic has come back into the world and starts a magical apocalypse where old spirits, gods, and every manner of mythical creature are awake and among the masses again. Nice Dragons Finish Last is set in this post-apocalyptic world in a very magical Detroit. The Lady of the Great Lakes, Algonquin, woke, destroyed the old Detroit by flooding it, and claimed it as her own. Annexed from the US, a new city has been rebuilt on top of the ruins and has become the Detroit Free Zone (DFZ). The DFZ is home to all manner of spirits, mages, shamans, and anyone looking for a place to start over, no matter how dangerous they are. It is both foreign and familiar. On the one hand, you have ghosts, retail stores full of everyday magical items, and nightmarish monsters. On the other hand, there is rampant commercialism in this city with all the latest technology and every kind of magic you can think of. Not to mention, the worry about pollution and a high crime rate. It’s almost like we’re talking about the real Detroit and not this mythical version of it. From what I can see, Rachel Aaron has only scratched the surface of this fascinating world and I can’t wait to find out more about it. There is only one type of creature not welcome in the DFZ and that would be dragons. And that is a problem considering that is where Julius’s mother has dumped him. Combine Julius illegally being in the DFZ trying to avoid certain death with the problems Marci is running from and you get a story that is one hell of a thrilling and highly entertaining ride! Dragons. Commercialized magic. Soul-sucking ghost cats. What more could you want? Well, besides the next book of course! I'd highly recommend picking this up before book two releases! This sounds interesting and I love dragons.